So it’s official. Swedish House Mafia decided to break up and that this is the last tour they are doing. This message has caused a lot of rumours as the reason for this isn’t clear so far and of course the fans are sad. Axwell, Sebastian Ingrosso and Steve Angello have reached a very high level and became Rockstars like no one has seen it coming. They shaped our lifes and we are thankful that we could have been part of this journey even if not everything matched our expectations. We are happy that we had the chance to witness some epic things with them. We are still waiting for the reason of the break up. The interview with Sebastian Ingrosso on Aftonbladet was a fake and we are sorry that we and other sites believed them. Besides the bad news about Swedish House Mafia we can announce that their next single “Don’t you worry child” will be officially released on July 16 and that another documentary is in the making. 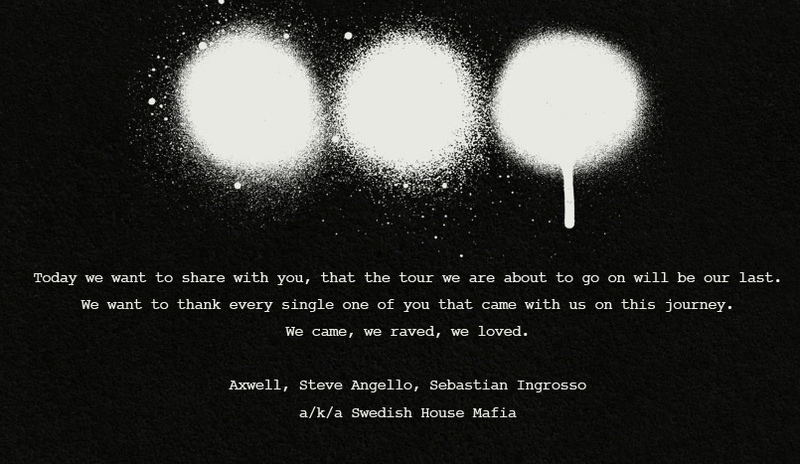 This post was re-edited after Swedish House Mafia denied that the interview was original. Aftonbladet faked it.